As a young girl, I was always proud to know that my maternal Uncle Carl served in the Canadian Military in Europe during World War II. Growing up in the early 1960's, with the war still recent history, I heard the stories and saw the snippets of war documentaries on TV when my dad watched occasionally. They became part of my own 'memory'. To this day I still love the music of that wartime era because somehow it made me feel more connected to my mom who actually lived during that time, and of course, also my uncle. As I recall, I seemed to be more aware of the solemnity of Remembrance Day in Grade 5. 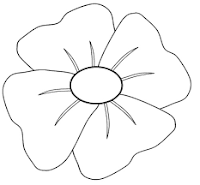 We'd take out blank paper in art class and learn to do simple poppy sketches. I loved drawing poppies, simple lines with gentle curves and that little dip at the top of each petal. And then taking the red crayon, enhancing the outlines by pressing the crayon firmly to make it darker than the rest of the petals. 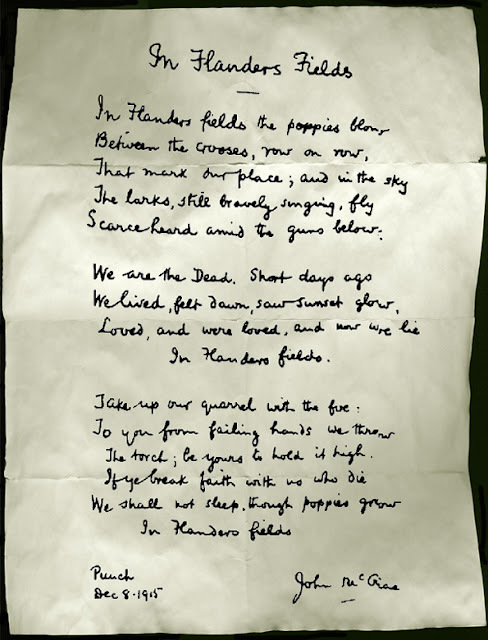 We struggled to memorize In Flanders Field written by Lt Col John McCrae who, born long ago in Guelph, Ontario, had been a Canadian physician, soldier, teacher and poet. Although I could not have described it then, I felt the poignancy of those words and the sense of loss. I tried to imagine what it must have been like to be a soldier, and we'd wear our red poppies with the poky pin proudly on our left side. Every November 11th (we'd have the day off from school) I'd listen eagerly to the commemoration ceremony on the radio and stand at attention at 11:00 am for the moment of silence as the radio would go dead. I'd feel a lump in my throat if I'd hear the bugle playing Taps or the mournful wail of the bagpipes. And I'd think of my Uncle Carl who used to be a soldier a long time ago. My own mom was just a little girl of six or seven or eight during World War II, so her memories of the war are vague about some things. But she remembers that they had rations books, even in Canada. She recalls her dad turning on the old radio to listen to the news from BBC ... she'd have to be quiet so they could hear about the latest events from across the ocean. And, she certainly remembers the day when she saw a man walking up the driveway on the family farm dressed in uniform. She was playing in the yard while her mom and another brother milked cows in the barn. She went flying to the barn shouting, "The war is here!" She ran behind the cow stalls and hid in a pile of hay. She didn't really know what war was, but she knew it wasn't good. Must have been a terrifying moment for her. Turned out to be her older brother, Carl, already enlisted in the Army but not yet sent to Europe. He was home for a little while. I remember seeing the above photo as a girl, feeling proud that that young man who, I see, has the same little smile as his son, was my uncle. 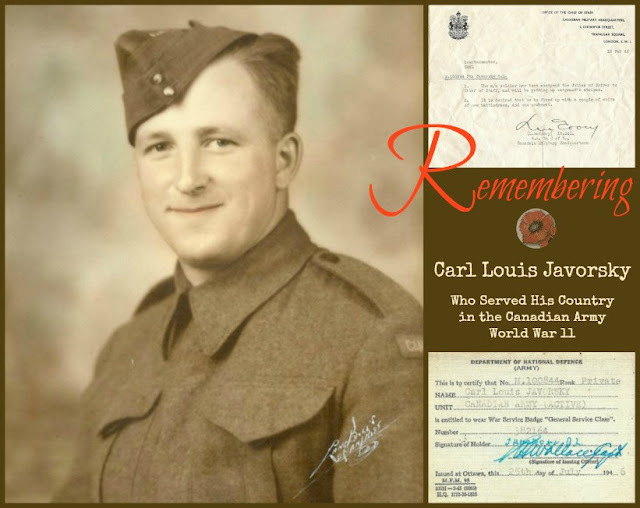 This week as the world remembers war and sacrifices and losses, I want to remember and give tribute to Sergeant Carl Louis Javorsky for serving his country in World War II. And, who thankfully came safely home from the war and also brought a war bride , my Aunty Betty from London, England to be a part of the family. Thank you Brenda, brought back many memories of my brother ! did you know that your dad [Dennis} knew by heart "In Flanders Fields" and I can still hear his voice as he would recite it. What a beautiful post and tribute. I attended a local quilt show ( Part One linked up to Mosaic Monday ) but Part Two is about a vintage quilt, all poppies made by 30 different ladies, common in the era of the 40's for veteran quilts. War is so sad. Beautiful tribute. Gave me goose bumps all over. God bless them all! Sharing these stories becomes very important as our generation is the last to remember the old stories. Your poor mother thinking that the war had arrived right at her own home. Hope that she didn't have to hide too long. Thank you for sharing. I am humbled each year when I watch the ceremonies. I will remember as long as I live. I grew up in Holland during the Second World War. My mother remembers her mother talking to a neighbor about the Japanese bombing Pearl harbor. She was just a girl of 7 years old in 1941 and she ran to hide under her bed because she thought that they were going to get bombed in Connecticut! I hope future generations will remember and pay tribute to family members as you have done here Brenda - very nice. I have my dad's navy photo and medals professionally staged in a shadow box hanging on the wall in our family room. What a lovely remembrance, Brenda and wonderful memories and photos of your uncle. I was picked to recite 'In Flanders Fields' for my town's Veteran's celebration when I was in 5th grade. I memorized the whole thing and a week before I was to speak, I came down with Strep, but I recovered enough to come through. My Grandmother still had the black-out shades in her windows when I was a little girl. They lived near an air base. The town would have air-raid drills regularly, right up through the early 60's, blasting the siren, and she would have to pull down all the shades to block out any light that could be seen from the air! What a beautiful tribute, Brenda. 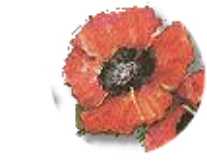 At my work, employees are encouraged to attend the annual Remembrance Day ceremony that is held at 10:45 am in our building. A lovely remembrance for Remembrance Day. We must not forget. I remember memorizing In Flanders Fields, and can say it to this day. In my Grade 7 year, I was chosen to read the poem at the all-school assembly. I say read, because when I offered that I knew it by heart, the teacher in charge thought it would be more fitting to read it. Thanks for this, Brenda, it's so important to remember! Remembering with you too Brenda, what a lovely tribute. I bought a $4 poppy for my handbag today from the poppy sellers #lestweforget. This is a lovely story and tribute Brenda. We will remember them, not only those that died defending our freedom, but those who came home maimed and damaged. When will we learn? Thank you for this lovely post. Have a peaceful week and thank you for stopping by my blog. You brought back a lot of memories with your special tribute to those who sacrificed so much! I am Canadian by birth, and do remember memorizing In Flander's Field, and the importance of wearing the poppy around Remembrance Day. My great-grandfather was in the war, and went through some pretty horrible stuff, and when he came back home, he struggled with those memories. A huge sacrifice is made by those who see the ugliness of war. May we never, ever forget what they did for our freedoms! You wrote a beautiful tribute to your Uncle Carl. Here in the US, the poppy is not worn like it is in Canada, and it really was a special thing to be out in the community around Remembrance Day and see the poppies everywhere. May we never forget, indeed! What a beautiful remembrance. My grandfather always had us remembering those who served in our family and in our community. What a wonderful tribute. Thank you for sharing!